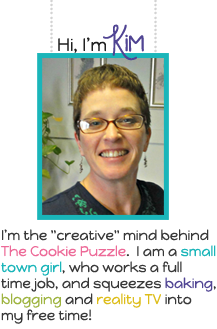 Hi, I am Kim, the "creative" mind behind The Cookie Puzzle. I am a small town girl, who works a full time job, and squeezes baking, blogging and reality TV into my free time! I started a blog to share my love of Decorated Cookies with the world, but over time, I have expanded to sharing recipes and crafts.. I am a wife to Mr. Cookie Puzzle, my wonderful husband going on 20 years. I am the mother of Collin, my amazing son, who has Autism. I am also the mom of two fur babies, Sadie Mae and Lupin, my MinPin mix babies. We also share our home with an aquatic turtle named Turquoise. I have a passion for baking, and have started trying my hand at crafting and other projects. I have an unhealthy addiction to Reality TV, that robs me of sleep. I try to read when I can, it is either an all or nothing hobby of mine, I will read non stop for months, then not pick up a book for months. I am a simple woman who tries to KISS (Keep it Simple Stupid) everything I try. Why bake a cake from scratch, when mixes taste great? Why crochet a scarf with complicated patterns, when a few simple stiches will yield a beautiful scarf. Why decorate a cookie with 18 gazillion colors, when 2-3 will make a gorgeous cookie. Thanks for stopping by......I hope you enjoy your stay!